We continue analyzing how OneRep differs from other competing services. Today’s article will tell you more about Reputation Defender. The evidence collected will show you that even the pioneer in the online security industry has to improve a lot in order to stay afloat. How easily it is to follow self-removal instructions (if they are provided)? Your satisfaction is important to us. Our goal is to help you make the best possible decision when selecting a service to help you protect your online privacy. ReputationDefender is considered to be the oldest online privacy company in the industry. It was created to provide digital privacy solutions and online reputation management for both businesses and individuals. Moreover, they’ve positioned themselves as leaders and pioneers in the online privacy industry. What’s interesting about ReputationDefender, is they offer two levels of privacy protection: Privacy PRO, aimed at personal privacy, and Executive Privacy, offering several levels of advanced protection. The table below highlights the differences between all ReputationDefender and OneRep plans. You’ll notice, virtually all of ReputationDefender’s plans have limits on what they’ll cover, while OneRep offers Unlimited protection and removal of your private data. OneRep believes customers shouldn’t have to pay a premium for an online privacy service that only offers limited protection. ReputationDefender only removes your most current online records, then pushes off the responsibility of removing any remaining entries to YOU, the paying customer. What sets OneRep apart from other online privacy companies, is we delete not only your most recent personal records, but also out-of-date information too – everything’s included, no matter what subscription plan you choose. OneRep believes in tying up loose ends, because you just never know what information can compromise your privacy or good reputation. Why take the risk? OneRep or ReputationDefender. Which is more affordable? According to ReputationDefender’s mission statement, “everyone has the right to be empowered online—whether that means controlling the spread of your personal information or the way you are portrayed to others”. Indeed. Everyone does have the right to be empowered online, but not everyone can afford ReputationDefender’s exorbitant pricing. OneRep vs. ReputationDefender - How many websites are included for each service? It’s essential for customers to know exactly what sort of information is covered and removed by their online privacy provider. Equally important, is knowing the exact number of people-search sites covered by the service you choose; do they cover just the most prolific sites, or are less known sites included as well? Some people-search sites are very well-known, conducting millions of background reports each year, while others are less prominent, but still pose a serious threat. To learn the truth, OneRep contacted ReputationDefender via anonymous live chat and asked them to provide examples of the websites they cover. Not surprisingly, ReputationDefender refused to provide this information via chat and suggested we call them instead. They made it seem as if this information was strictly confidential, and even a paying customer didn’t have the right to know what it was. Why? Shouldn’t you know what you’re paying for? Alright, we decided to play their little game and called ReputationDefender directly. 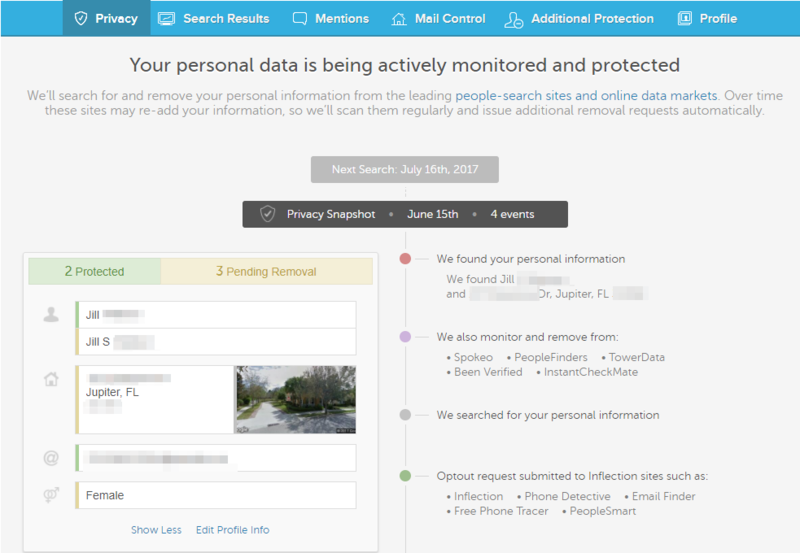 With some persistence, we were finally able to pry a little information from them and learned that Privacy PRO members get automatic removal from 22 websites, which include, Spokeo, BeenVerified and PeopleFinder, the most common data brokers. Furthermore, we went an extra mile and purchased 1 month subscription to see how the service works. We also wanted to check how user friendly the dashboard is. Have a look at the screenshot below. ReputationDefender asked to provide some personal data based on which they were able to find only 5 websites. However they didn’t specify what websites in particular. Again the subscription costs $9.95. For comparison, we managed to find 24 websites about the same individual. And you know exactly where your data was removed from and when. Still, it is not clear what is the purpose of these colorful circles located in the right part of the screenshot. The text near them doesn’t provide any useful information. It seems like ReputationDefender is simply trying to give relevance to their job, making you believe that for $9.95 they do a lot. In fact, they don’t. But there is one small issue. Once you’ve paid for Privacy PRO you get an access to your personal dashboard. One of the pages in the dashboard is called “Additional Protection”. Have a look at the screenshot of the page. So, according to ReputationDefender they “want to give you additional information you can use to further protect your privacy, free of charge”. After you click on the orange button “Begin Opt-Out” you are simply redirected to the opt-out page of these websites and proceed the removal process by yourself. Nevertheless, ReputationDefender focuses on the fact that it helps you and does it for free. In fact, it does nothing in this particular case. The Plans guarantee advanced protection and delete profiles from 61 people-search websites. However, when we asked for details about the 61 sites included, ReputationDefender again refused to offer any specifics. So in effect, you’re paying a hefty premium and just have to go on blind faith. Does that sound fair to you? OneRep believes our customers have the right to know what they’re paying for. We remove your personal data from over 77 people-search sites, and you can find a complete list of all of them on our “Sites we cover” page. We didn’t just compile a list of the most common websites that expose your records, but went the extra mile and expanded our search to include a host of secondary websites in order to offer you the most comprehensive protection possible. But we don’t stop there. OneRep encourages customers to send us links for any website that’s not on our list, and we’ll handle those removals under your current subscription plan, with no additional fees. Our team members strive to do their very best for you, and will remove all online records that threaten to compromise your personal life and privacy. ReputationDefender offers similar protection, but only for their Executive Privacy Plus and Executive Privacy Premium customers, which cost $5,000 and $10,000 annually. ReputationDefender provides support via live chat, email and phone. To test the quality of their customer service, OneRep contacted ReputationDefender’s support team several times via live chat and received identical scripted responses each time. Then we contacted them via email on 3 separate occasions, asking completely different questions each time, and again, we received 3 identical email responses from their support representatives. Did they even read our emails? It’s as if ReputationDefender’s support team has been coached to send the same scripted replies no matter what the customer asks. They don’t care about listening to your needs, all they want is your money. OneRep believes personal privacy is a serious matter, and we don’t play games with our customer’s lives. We never send scripted responses. OneRep respects our customers enough to offer personal, one-on-one support, that meets all of our customer’s unique needs. If you ever have technical problems or questions about our service, OneRep’s Privacy Experts are ready to provide quality assistance. OneRep offers free phone, email and chat consultations – we’re here for you whenever you need us. Just leave us a message and phone number, and we guarantee you’ll receive a callback within a few hours; often immediately. In short, Yes. But if you dig deeper, you’ll realize it can be a very daunting and time-consuming process that will test your sanity and patience. Even if you don’t subscribe to our service, you have the right to contact the various people-search sites directly and request the removal of your personal data. Your private records are your own and don’t belong in the public domain. It’s just flat wrong. Some online privacy companies offer limited self-opt-out instructions, others offer no instructions at all. But what about OneRep and ReputationDefender? 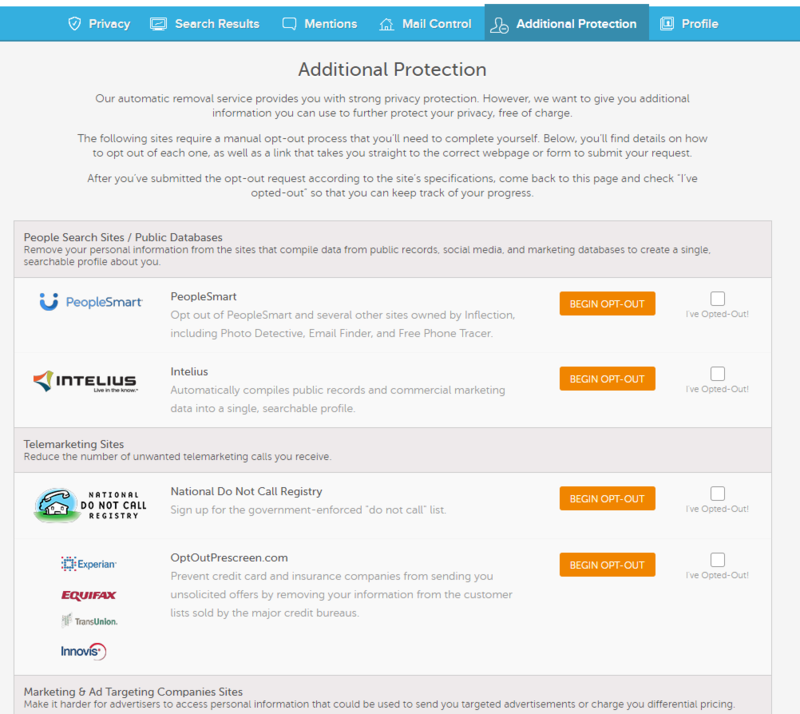 OneRep offers FREE self-opt-out instructions for more than one hundred websites. Our comprehensive instructions are quite detailed and include screenshots to help you navigate the opt-out process for the most popular people search websites. By contrast, ReputationDefender doesn’t provide opt-out instructions of any kind. OneRep takes your online privacy seriously, and we’re committed to helping you and your family maintain a safe online experience. OneRep vs. ReputationDefender – How many websites are included for each service?